As the morning star, the evening star, and the brightest natural object in the sky (after the Moon), human beings have been aware of Venus since time immemorial. Even though it would be many thousands of years before it was recognized as being a planet, its has been a part of human culture since the beginning of recorded history. Because of this, the planet has played a vital role in the mythology and astrological systems of countless peoples. With the dawn of the modern age, interest in Venus has grown, and observations made about its position in the sky, changes in appearance, and similar characteristics to Earth have taught us much about our Solar System. Because of its similar size, mass, proximity to the Sun, and composition, Venus is often referred to as Earth’s “sister planet”. With a mass of 4.8676×1024 kg, a surface area of 4.60 x 108 km², and a volume of 9.28×1011 km3, Venus is 81.5% as massive as Earth, and has 90% of its surface area and 86.6% of its volume. When Venus lies between Earth and the Sun, a position known as inferior conjunction, it makes the closest approach to Earth of any planet, at an average distance of 41 million km (making it the closest planet to Earth). This takes place, on average, once every 584 days. The planet completes an orbit around the Sun every 224.65 days, meaning that a year on Venus is 61.5% as long as a year on Earth. Unlike most other planets in the Solar System, which rotate on their axes in an counter-clockwise direction, Venus rotates clockwise (called “retrograde” rotation). It also rotates very slowly, taking 243 Earth days to complete a single rotation. This is not only the slowest rotation period of any planet, it also means that a sidereal day on Venus lasts longer than a Venusian year. Little direct information is available on the internal structure of Venus. However, based on its similarities in mass and density to Earth, scientists believe that they share a similar internal structure – a core, mantle, and crust. Like that of Earth, the Venusian core is believed to be at least be partially liquid because the two planets have been cooling at about the same rate. One difference between the two planets is the lack of evidence for plate tectonics, which could be due to its crust being too strong to subduct without water to make it less viscous. This results in reduced heat loss from the planet, preventing it from cooling and the possibility that internal heat is lost in periodic major resurfacing events. This is also suggested as a possible reason for why Venus has no internally generated magnetic field. Venus’ surface appears to have been shaped by extensive volcanic activity. Venus also has several times as many volcanoes as Earth, and has 167 large volcanoes that are over 100 km across. The presence of these volcanoes is due to the lack of plate tectonics, which results in an older, more preserved crust. Whereas Earth’s oceanic crust is subject to subduction at its plate boundaries, and is on average ~100 million years old, the Venusian surface is estimated to be 300-600 million years of age. There are indications that volcanic activity may be ongoing on Venus. Missions performed by the Soviet space program in 1970s and more recently by the European Space Agency have detected lightning storms in Venus’ atmosphere. Since Venus does not experience rainfall (except in the form of sulfuric acid), it has been theorized that the lightning is being caused by a volcanic eruption. Other evidence is the periodic rise and fall of sulfur dioxide concentrations in the atmosphere, which could be the result of periodic, large volcanic eruptions. And finally, localized infrared hot spots (likely to be in the range of 800 – 1100 K) have appeared on the surface, which could represent lava freshly released by volcanic eruptions. The preservation of Venus’ surface is also responsible for its impact craters, which are impeccably preserved. Almost a thousand craters exist, which are evenly distributed across the surface and range from 3 km to 280 km in diameter. No craters smaller than 3 km exist because of the effect the dense atmosphere has on incoming objects. Essentially, objects with less than a certain amount of kinetic energy are slowed down so much by the atmosphere that they do not create an impact crater. And incoming projectiles less than 50 meters in diameter will fragment and burn up in the atmosphere before reaching the ground. Surface observations of Venus have been difficult in the past, due to its extremely dense atmosphere, which is composed primarily of carbon dioxide with a small amount of nitrogen. At 92 bar (9.2 MPa), the atmospheric mass is 93 times that of Earth’s atmosphere and the pressure at the planet’s surface is about 92 times that at Earth’s surface. Venus is also the hottest planet in our Solar System, with a mean surface temperature of 735 K (462 °C/863.6 °F). This is due to the CO²-rich atmosphere which, along with thick clouds of sulfur dioxide, generates the strongest greenhouse effect in the Solar System. Above the dense CO² layer, thick clouds consisting mainly of sulfur dioxide and sulfuric acid droplets scatter about 90% of the sunlight back into space. 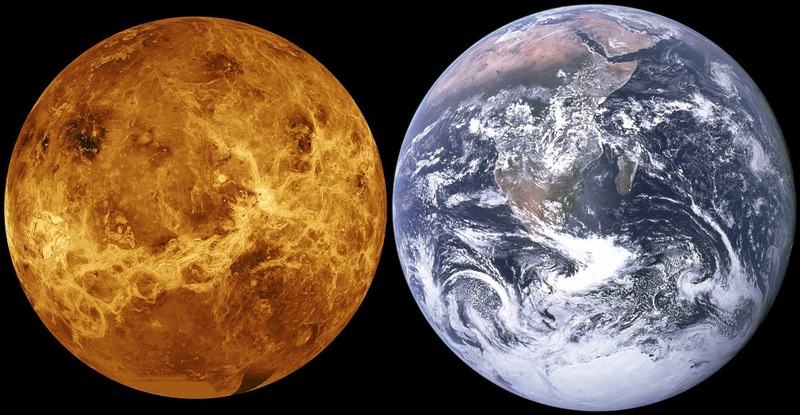 The surface of Venus is effectively isothermal, which means that their is virtually no variation in Venus’ surface temperature between day and night, or the equator and the poles. The planet’s minute axial tilt – less than 3° compared to Earth’s 23° – also minimizes seasonal temperature variation. The only appreciable variation in temperature occurs with altitude. The highest point on Venus, Maxwell Montes, is therefore the coolest point on the planet, with a temperature of about 655 K (380 °C) and an atmospheric pressure of about 4.5 MPa (45 bar). Another common phenomena is Venus’ strong winds, which reach speeds of up to 85 m/s (300 km/h; 186.4 mph) at the cloud tops and circle the planet every four to five Earth days. At this speed, these winds move up to 60 times the speed of the planet’s rotation, whereas Earth’s fastest winds are only 10-20% of the planet’s rotational speed. Venus flybys have also indicated that its dense clouds are capable of producing lightning, much like the clouds on Earth. Their intermittent appearance indicates a pattern associated with weather activity, and the lightning rate is at least half of that on Earth. Although ancients peoples knew about Venus, some of the cultures thought it was two separate celestial objects – the evening star and the morning star. Although the Babylonians realized that these two “stars” were in fact the same object – as indicated in the Venus tablet of Ammisaduqa, dated 1581 BCE – it was not until the 6th century BCE that this became a common scientific understanding. Many cultures have identified the planet with their respective goddess of love and beauty. Venus is the Roman name for the goddess of love, while the Babylonians named it Ishtar and the Greeks called it Aphrodite. The Romans also designated the morning aspect of Venus Lucifer (literally “Light-Bringer”) and the evening aspect as Vesper (“evening”, “supper”, “west”), both of which were literal translations of the respective Greek names (Phosphorus and Hesperus). The transit of Venus in front of the Sun was first observed in 1032 by the Persian astronomer Avicenna, who concluded that Venus is closer to Earth than the Sun. In the 12th century, the Andalusian astronomer Ibn Bajjah observed two black spots in front of the sun, which were later identified as the transits of Venus and Mercury by Iranian astronomer Qotb al-Din Shirazi in the 13th century. By the early 17th century, the transit of Venus was observed by English astronomer Jeremiah Horrocks on December 4th, 1639, from his home. William Crabtree, a fellow English astronomer and friend of Horrocks’, observed the transit at the same time, also from his home. When the Galileo Galilei first observed the planet in the early 17th century, he found it showed phases like the Moon, varying from crescent to gibbous to full, and vice versa. This behavior, which could only be possible if Venus’ orbited the Sun, became part of Galileo’s challenge to the Ptolemaic geocentric model and his advocacy of the Copernican heliocentric model. The atmosphere of Venus was discovered in 1761 by Russian polymath Mikhail Lomonosov, and then observed in 1790 by German astronomer Johann Schröter. Schröter found when the planet was a thin crescent, the cusps extended through more than 180°. He correctly surmised this was due to the scattering of sunlight in a dense atmosphere. In December 1866, American astronomer Chester Smith Lyman made observations of Venus from the Yale Observatory, where he was on the board of managers. While observing the planet, he spotted a complete ring of light around the dark side of the planet when it was at inferior conjunction, providing further evidence for an atmosphere. Little else was discovered about Venus until the 20th century, when the development of spectroscopic, radar, and ultraviolet observations made it possible to scan the surface. The first UV observations were carried out in the 1920s, when Frank E. Ross found that UV photographs revealed considerable detail, which appeared to be the result of a dense, yellow lower atmosphere with high cirrus clouds above it. Spectroscopic observations in the early 20th century also gave the first clues about the Venusian rotation. Vesto Slipher tried to measure the Doppler shift of light from Venus. After finding that he could not detect any rotation, he surmised the planet must have a very long rotation period. Later work in the 1950s showed the rotation was retrograde. Radar observations of Venus were first carried out in the 1960s, and provided the first measurements of the rotation period, which were close to the modern value. Radar observations in the 1970s, using the radio telescope at the Arecibo Observatory in Puerto Rico revealed details of the Venusian surface for the first time – such as the presence of the Maxwell Montes mountains. The first attempts to explore Venus were mounted by the Soviets in the 1960s through the Venera Program. The first spacecraft, Venera-1 (also known in the west as Sputnik-8) was launched on February 12th, 1961. However, contact was lost seven days into the mission when the probe was about 2 million km from Earth. By mid-may, it was estimated that the probe had passed within 100,000 km (62,000 miles) of Venus. The United States launched the Mariner 1 probe on July 22nd, 1962, with the intent of conducting a Venus flyby; but here too, contact was lost during launch. The Mariner 2 mission, which launched on December 14th, 1962, became the first successful interplanetary mission and passed within 34,833 km (21,644 mi) of Venus’ surface. Its observations confirmed earlier ground-based observations which indicated that though the cloud tops were cool, the surface was extremely hot – at least 425 °C (797 °F). This put an end all speculation that the planet might harbor life. Mariner 2 also obtained improved estimates of Venus’s mass, but was unable to detect either a magnetic field or radiation belts. The Venera-3 spacecraft was the Soviets second attempt to reach Venus, and their first attempted to place a lander on the planet’s surface. The spacecraft cash-landed on Venus on March 1st, 1966, and was the first man-made object to enter the atmosphere and strike the surface of another planet. Unfortunately, its communication system failed before it was able to return any planetary data. On October 18th, 1967, the Soviets tried again with the Venera-4 spacecraft. After reaching the planet, the probe successfully entered the atmosphere and began studying the atmosphere. In addition to noting the prevalence of carbon dioxide (90-95%), it measured temperatures in excess of what Mariner 2 observed, reaching almost 500 °C. Due to the thickness of Venus’ atmosphere, the probe descended slower than anticipated, and its batteries ran out after 93 minutes when the probe was still 24.96 km from the surface. One day later, on October 19th, 1967, Mariner 5 conducted a fly-by at a distance of less than 4000 km above the cloud tops. Originally built as a backup for the Mars-bound Mariner 4, the probe was refitted for a Venus mission after Venera-4‘s success. The probe managed to collect information on the composition, pressure and density of the Venusian atmosphere, which was then analyzed alongside the Venera-4 data by a Soviet-American science team during a series of symposiums. Venera-5 and Venera-6 were launched in January of 1969, and reached Venus on 16th and 17th of May. Taking into account the extreme density and pressure of Venus’ atmosphere, these probes were able to achieve a faster descent and reached an altitude of 20 km before being crushed – but not before returning over 50 minutes of atmospheric data. The Venera-7 was built with the intent of returning data from the planet’s surface, and was construed with a reinforced descent module capable of withstanding intense pressure. While entering the atmosphere on December 15th, 1970, the probe crashed on the surface, apparently due to a ripped parachute. Luckily, it managed to return 23 minutes of temperature data and the first telemetry from the another planet’s surface before going offline. The Soviets launched three more Venera probes between 1972 and 1975. The first landed on Venus on July 22nd, 1972, and managed to transmit data for 50 minutes. Venera-9 and 10 – which entered Venus’ atmosphere on October 22nd and October 25th, 1975, respectively – both managed to send back images of Venus’ surface, the first images ever taken of another planet’s landscape. On November 3rd, 1973, the United States had sent the Mariner 10 probe on a gravitational slingshot trajectory past Venus on its way to Mercury. By February 5th, 1974, the probe passed within 5790 km of Venus, returning over 4000 photographs. The images, which were the best to date, showed the planet to be almost featureless in visible light; but revealed never-before-seen details about the clouds in ultraviolet light. By the late seventies, NASA commenced the Pioneer Venus Project, which consisted of two separate missions. The first was the Pioneer Venus Orbiter, which inserted into an elliptical orbit around Venus on December 4th, 1978, where it studied its atmosphere and mapped the surface for a period of 13 days. The second, the Pioneer Venus Multiprobe, released a total of four probes which entered the atmosphere on December 9th, 1978, returning data on its composition, winds and heat fluxes. Four more Venera lander missions took place between the late 70s and early 80s. Venera 11 and Venera 12 detected Venusian electrical storms; and Venera 13 and Venera 14 landed on the planet on March 1st and 5th, 1982, returning the first color photographs of the surface. The Venera program came to a close in October 1983, when Venera 15 and Venera 16 were placed in orbit to conduct mapping of the Venusian terrain with synthetic aperture radar. In 1985, the Soviets participated in a collaborative venture with several European states to launch the Vega Program. This two-spacecraft initiative was intended to take advantage of the appearance of Halley’s Comet in the inner Solar System, and combine a mission to it with a flyby of Venus. While en route to Halley on June 11th and 15th, the two Vega spacecraft dropped Venera-style probes supported by balloons into the upper atmosphere – which discovered that it was more turbulent than previously estimated, and subject to high winds and powerful convection cells. NASA’s Magellan spacecraft was launched on May 4th, 1989, with a mission to map the surface of Venus with radar. In the course of its four and a half year mission, Magellan provided the most high-resolution images to date of the planet and was able to map 98% of the surface and 95% of its gravity field. In 1994, at the end of its mission, Magellan was sent to its destruction into the atmosphere of Venus to quantify its density. Venus was observed by the Galileo and Cassini spacecraft during flybys on their respective missions to the outer planets, but Magellan was the last dedicated mission to Venus for over a decade. It was not until October of 2006 and June of 2007 that the MESSENGER probe would conduct a flyby of Venus (and collect data) in order to slow its trajectory for an eventual orbital insertion of Mercury. The Venus Express, a probe designed and built by the European Space Agency, successfully assumed polar orbit around Venus on April 11th, 2006. This probe conducted a detailed study of the Venusian atmosphere and clouds, and discovered an ozone layer and a swirling double-vortex at the south pole before concluding its mission in December of 2014. The Japan Aerospace Exploration Agency (JAXA) devised a Venus orbiter – Akatsuki (formerly “Planet-C”) – to conduct surface imaging with an infrared camera, studies on Venus’ lightning, and to determine the existence of current volcanism. The craft was launched on May 20th, 2010, but the craft failed to enter orbit in December 2010. Its main engine is still offline, but its controllers will attempt to use its small attitude control thrusters to make another orbital insertion attempt on December 7th, 2015. In late 2013, NASA launched the Venus Spectral Rocket Experiment, a sub-orbital space telescope. This experimented is intended to conduct ultraviolet light studies of Venus’s atmosphere, for the purpose of learning more about the history of water on Venus. The European Space Agency’s (ESA) BepiColombo mission, which will launch in January 2017, will perform two flybys of Venus before it reaches Mercury orbit in 2020. NASA will launch the Solar Probe Plus in 2018, which will perform seven Venus flybys during its six-year mission to study the Sun. Under its New Frontiers Program, NASA has proposed mounting a lander mission to Venus called the Venus In-Situ Explorer by 2022. The purpose will be to study Venus’ surface conditions and investigate the elemental and mineralogical features of the regolith. The probe would be equipped with a core sampler to drill into the surface and study pristine rock samples not weathered by the harsh surface conditions. The Venera-D spacecraft is a proposed Russian space probe to Venus, which is scheduled to be launched around 2024. This mission will conduct remote-sensing observations around the planet and deploy a lander, based on the Venera design, capable of surviving for a long duration on the surface. Because of its proximity to Earth, and its similarity in size, mass and composition, Venus was once believed to hold life. In fact, the idea of Venus being a tropical world persisted well into the 20th century, until the Venera and Mariner programs demonstrated the absolute hellish conditions that actually exist on the planet. Nevertheless, it is believed that Venus may once have been much like Earth, with a similar atmosphere and warm, flowing water on its surface. This notion is supported by the fact that Venus sits within the inner edge of the Sun’s habitable zone and has an ozone layer. However, owing to the runaway greenhouse effect and the lack of a magnetic field, this water disappeared many billions of years ago. Still, there are those who believed that Venus could one day support human colonies. Currently, the atmospheric pressure near to the ground is far too extreme for settlements to be built on the surface. But 50 km above the surface, both the temperature and air pressure are similar to Earth’s, and both nitrogen and oxygen are believed to exist. This has led to proposals for “floating cities” to be built in the Venusian atmosphere and the exploration of the atmosphere using Airships. In addition, proposals have been made suggesting the Venus should be terraformed. These have ranged from installing a huge space-shade to combat the greenhouse effect, to crashing comets into the surface to blow the atmosphere off. Other ideas involve converting the atmosphere using calcium and magnesium to sequester the carbon away. Much like proposals to terraform Mars, these ideas are all in their infancy and are hard-pressed to address the long-term challenges associated with changing the planet’s climate. However, they do show that humanity’s fascination with Venus has not diminished over time. From being a central to our mythology and the first star we saw in the morning (and the last one we saw at night), Venus has since gone on to become a subject of fascination for astronomers and a possible prospect for off-world real estate. 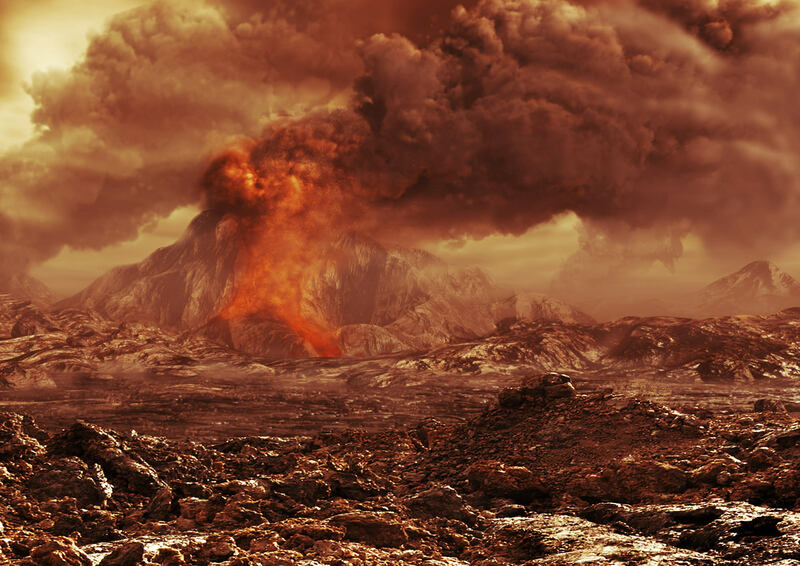 But until such time as technology improves, Venus will remain Earth’s hostile and inhospitable “sister planet”, with intense pressure, sulfuric acid rains, and a toxic atmosphere. We have written many interesting articles about Venus here at Universe Today. For example, here’s The Planet Venus, Interesting Facts About Venus, What is the Average Temperature of Venus?, How Do We Terraform Venus? and Colonizing Venus With Floating Cities. Astronomy Cast also has an episode on the subject – Episode 50: Venus, and Larry Esposito and Venus Express. For more information, be sure to check out NASA Solar System Exploration: Venus and NASA Facts: Magellan Mission to Venus.